Welcome Summer and Welcome Mango season. Markets are filled with different varieties of mangoes and everyone are upto buying and trying different dishes from these wonderful mangoes. There are different varieties of mangoes but the ones I like in Bangalore is a mango variety called "Badami" and the ones which we get in Goa called "Mankura". My son was waiting for Mango season and his holidays. 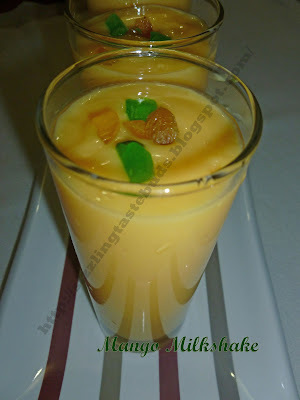 He knew he will get mangoes during his summer vacation and whenever we step out of the house, we, mother and son are sure upto the juice center to have a cool glass of this Mango Milkshake. I too prepare this during this season and he wants it to be presented just like the ones he gets in the juice center. Thats the demand of this generation kids. I too don't mind serving this as per his demand because usually he doesnot like milk but given it in the form of milkshake he is very happy and so do I. 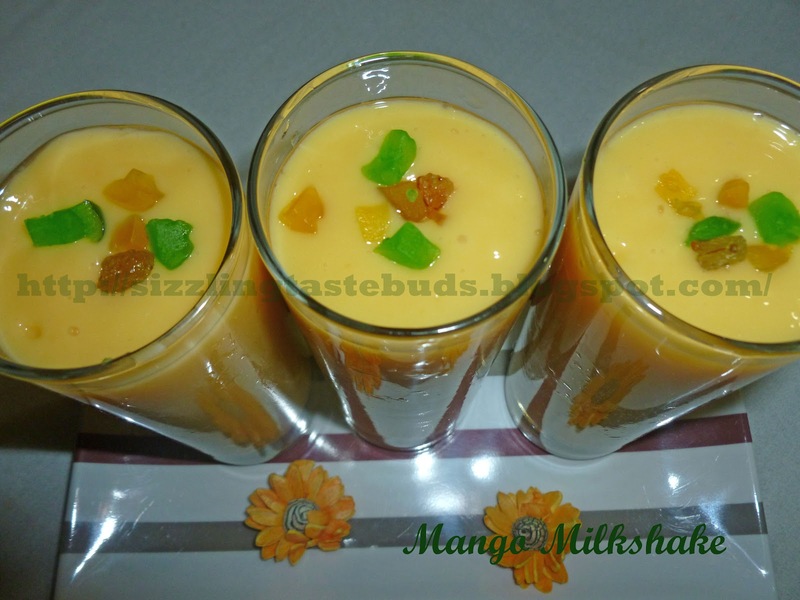 Here's the simple recipe of Mango Milkshake. 1. Peel the mangoes and remove the pulp. 2. Blend all the ingredients in a mixer to a smooth flowing consistency and pour it the serving glasses. 3. Garnish with tutty-fruity and nuts and serve chilled. You can also top with mango Ice cream and serve or just blend a scoop in a mixer to enhance the taste. Thats my son's suggestion or call it his demand...thanks for dropping by. my all time fav..lovely drink.. Thanks for dropping by and for the lovely comment.